Hi all. I'm asking for some advices from experts. I am into lego technic "standard" constructions from a few years, now I want to enter in the world of modding and make some custom creations. I love electric models, speed and the "mechanical engineering" behind LTechnic. I also know the existence of SBrick and I love the idea and I want to support them. Then i think that a good start can be the motorization of an existing model, adapting it to power function, engine, steering and SBrick. I am thinking about buying the 42037 Off Roader or maybe the 42039 LeMans Race Car. I have an old (10-15 years old) offroader, I can disassemble it and get some parts from it, mabye. Is it a good way to start? I need something else important? Id start off with just 42037 and RC-ifying it, that should give you a decent amount of work if you want to do it well, especially if you want to keep the original fake motor in there and connected up. I did the same with the 42022 hot-rod, although i had to disconnect the fake motor and turn it into a V4 rather then a V6 to get my servo in there. It was a great challenge. Also, id consider going for the L-motor rather then the XL, the L has faster revs, but less torque, which can be fixed with gearing, and is much compacter, but will drive something like 42022 (and id guess 42037) at a decent pace. For small to medium MOC's I always end up using the L motor as my go to. The XL has its applications, but for a bit of pace the L motor always works! Get a pair of them if your budget allows it, they always come in handy. Ok, I understand. L motor have more speed but less torque than the XL, then it's better for RC race and off-road cars. In alternative, if I buy an XL motor, can I play with gears to reduce the torque and increase the speed? Another alternative can be buy 2 L engines, and connect them with a central gear (as I saw in some pictures). Will it fit in the 42037? I have no problem removing the fake engine, the only thing that concerns me is that the final result will be esthetically acceptable, but my main concern is about performance (and a good steering system). With SBrick I can probably control both engines with the same virtual analogical input, right? Im not familiar enough with the S-brick to help you there (the reportedly lacking android support keeps me away), but if you plan on controlling two L motors through the PF IR system, you will need the elusive v.2 IR receiver, which you can only buy through bricklink (it only came in the big rock crawler set) to run the motors at full power. I have V.1 IR receivers and they work fine with a servo and L motor. I only use them indoors though. If you can get an 8081 extreme cruiser, it's great for modding with power functions. I would go for L motor over Xl. If you want more torque you can double up on L's. I can't help you with sbrick. I have an android! The 8081 is nice! But it costs 3 times the 42037, and I think it's a little too big for achieving good speed performances. It should be easy to find a set that contains most of the parts you need. The really good RC cars use the buggy motors, but those are long discontinued and can be hard to find and expensive. There are 2 issues with the Buggy 2 - the springs and the wheel hubs it uses are not very common in current sets, but they can be modded to use the smaller springs and the new hub that results in 5 stud height of the suspension arms. Yes, the SBrick can drive 2 separate motors (on 2 separate connectors), and even drive one inverted, from the same control slider - so you don't need the PF switch. Also, there was a major overhaul to the Android app for Sbrick a few weeks ago, and it's finally very good and stable, the range is fixed too. There are some efforts to make an app that can use an android compatible physical controller, but I didn't get around to testing it yet. I would buy a L motor over the XL to power either one of those sets. You can surely get a XL to fit, but L would be much easier, IMO. The Madoca's Buggy 2 is so cool! I'll be very happy if my first creation will be something like this. 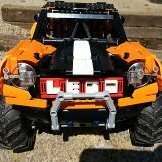 Can I get the parts I need to make something similar from the 42037 Off-Roader? Then i should buy 2 L motors, 1 servomotor and SBrick, right? With some led lights it will be perfect. Using 2 separate motors for the rear wheels will not cause the buggy to not go straight? The battery box seems different from the actual in the PF Set, will it be mountable and easily removable also if it's bigger? The buggy does drift slightly, but it drives fast enough that you won't want to just go straight. If you don't want to buy the rechargeable bb that madoca used, you can get the train bb that uses AAA sized batteries instead. Rebrickable.com is a great site for helping determine what you can build with your sets as well as what sets will help you get the pieces you need. At the bottom of the page you can see gerger made a variant of it that uses the big PF battery box - of course you loose the seat to have it fit, but it works fine. His also has different size wheels, different ride height and so one. Not sure about the parts, but you can use the rebrickable website to check the part list, I think there are some tools to compare them too and see what's missing. For example Madoca's also uses the link/rod Technic Link 1 x 9 that only appears in few sets, and only a single one in each, except for the 42000 that has 7. So you won't really find any sets that have all the parts for this - you either order the missing ones from bricklink or other sites or adapt the design to what you have. I just finished "modding" my 42037 Off-Roader. I say this because I extended the chassis by about 9 studs, changed the bodywork and added full RC. Use coupled L-motors and a Servo with an S-brick.